"Freeform" might very well be Cheri Meyer's middle name! Everything she sees that catches her eye sends her running for her beads, putting them together however it seems right at the time. My free form peyote stitch bead work has no actual pattern or preconceived idea of how the piece will look when finished. 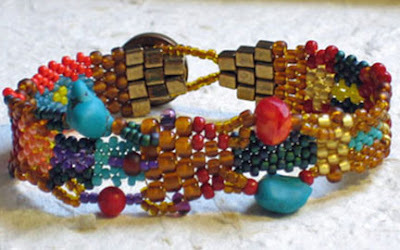 It all starts with some visual inspiration that crosses my path, a mixture of color, a unique bead, a colorful pattern from a piece of material or a painting that speaks to me. 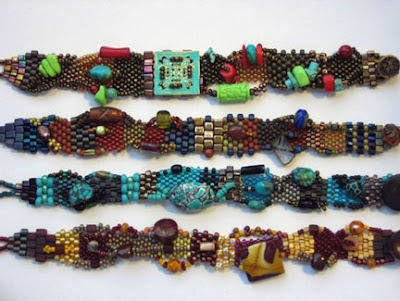 Once the inspiration strikes my enthusiasm to gather a colorful pallet of beads becomes a passionate journey to take a needle and thread and one bead at a time to create something so wonderfully complex you can’t stop looking it! Fantastic bracelets! 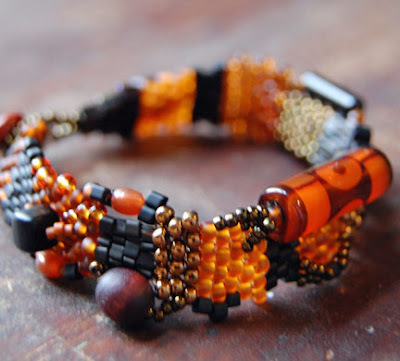 Love the color choices and various bead combinations. Cheri's work is absolutely beautiful! Very different from other beadwork I've seen and just beautiful the way she combines colors and textures. Thanks so much for sharing!